As the weather cools down, there is nothing better than a relaxing Friday night in the garden with good friends, multiple beers and great food served over a week’s worth of gossip. “The team” came over last Friday and I promised burgers on the grill. They came prepared with libations and side salads. 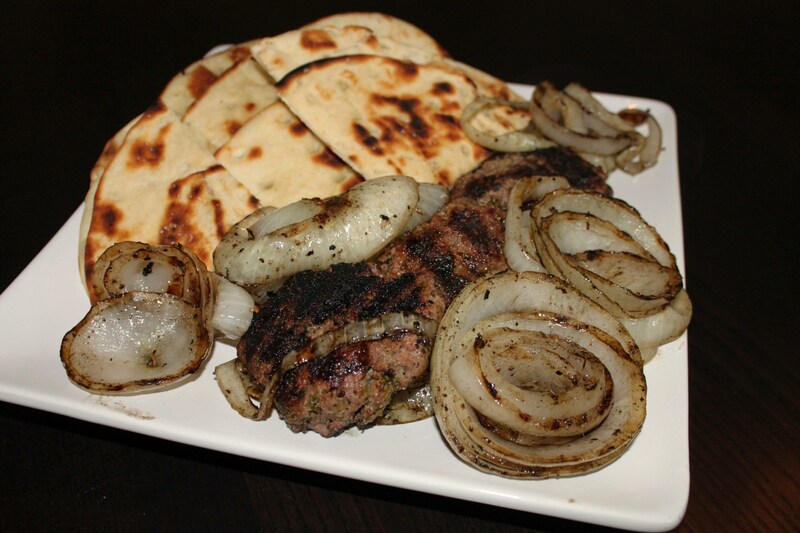 With a desire to spice up the evening, I put together a spread of lamb burgers with grilled onion and pita bread. These pieces can be assembled into a burger but I like to eat them like meze (selection of Mediterranean small dishes). I served this with a Roasted Red Pepper and Feta spread to slather on the burger and pita (I’ll post tomorrow). This recipe is just as easy as your regular American burger but adds a little surprise to the night. And that doesn’t include the spicy banter. Assembly: Combine first nine ingredients and assemble into 3 or 4 patties depending on how large you want them. Season burgers with salt and pepper. Season onion with olive oil, salt and pepper. Grill the lamb burgers and onion. Let them rest. Brush the pita with a little olive oil and salt. Quickly toast the pita on the grill.